Espresso is made by forcing very hot water under high pressure through finely ground, compacted coffee. Tamping down the coffee promotes the water's even penetration of the grounds. This process produces an almost syrupy beverage by extracting both solid and dissolved components. The crema is produced by emulsifying the oils in the ground coffee into a colloid, which does not occur in other brewing methods. There is no universal standard defining the process of extracting espresso, but there are several published definitions which attempt to place constraints on the amount and type of ground coffee used, the temperature and pressure of the water, and the rate of extraction. Generally, one uses an espresso machine to make espresso. 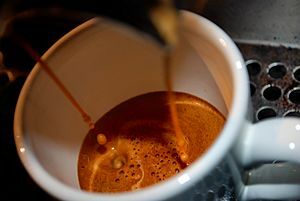 The act of producing a shot of espresso is often termed "pulling" a shot, originating from lever espresso machines, which require pulling down a handle attached to a spring-loaded piston, forcing hot water through the coffee at high pressure. Today, however, it is more common for the pressure to be generated by an electric pump. 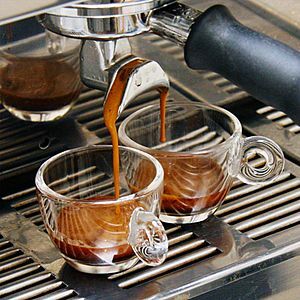 Espresso is both a coffee beverage and a brewing method. It is not a specific bean, bean blend, or roast level. Any bean or roasting level can be used to produce authentic espresso. 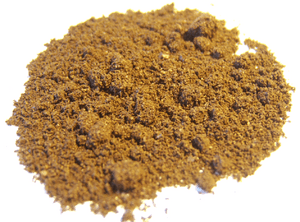 For example, in southern Italy, a darker roast is generally preferred. Farther north, the trend moves toward slightly lighter roasts, while outside Italy, a wide range is popular. Angelo Moriondo's Italian patent for a steam-driven "instantaneous" coffee beverage making device, which was registered in Turin in 1884 (No. 33/256), is notable. 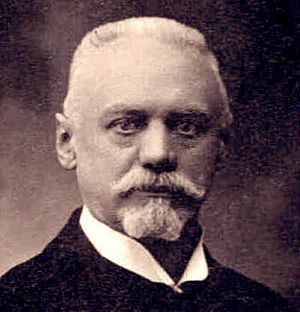 Author Ian Bersten, whose history of coffee brewers is cited below, claims to have been the first to discover Moriondo's patent. 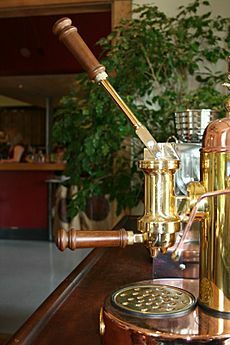 Bersten describes the device as "almost certainly the first Italian bar machine that controlled the supply of steam and water separately through the coffee" and Moriondo as "certainly one of the earliest discoverers of the expresso [sic] machine, if not the earliest." Unlike true espresso machines, it was a bulk brewer, and did not brew coffee for the individual customer. Seventeen years later, in 1901, Luigi Bezzera, from Milan, came up with a number of improvements to the espresso machine. He patented a number of these, the first of which was applied for on the 19th of December 1901. It was titled "Innovations in the machinery to prepare and immediately serve coffee beverage" (Patent No. 153/94, 61707, granted on the 5 June 1902). In 1905, the patent was bought by Desiderio Pavoni, who founded the La Pavoni company and began to produce the machine industrially (one a day) in a small workshop in Via Parini in Milan. In the English-speaking world, espresso became popular, particularly in the form of cappuccino, due to the tradition of drinking coffee with milk and the exotic appeal of the foam; in the United States, this was more often in the form of lattes, with or without flavored syrups added. The latte is claimed to have been invented in the 1950s by Italian American Lino Meiorin of Caffe Mediterraneum in Berkeley, California, as a long cappuccino, and was then popularized in Seattle, and then nationally and internationally by Seattle-based Starbucks in the late 1980s and 1990s. 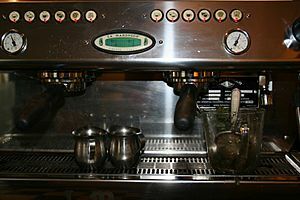 In the United Kingdom, espresso grew in popularity among youth in the 1950s, who felt more welcome in the coffee shops than in public houses (pubs). 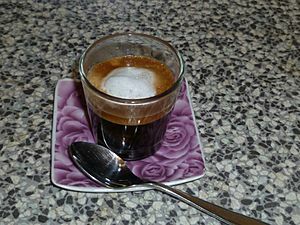 Espresso was initially popular, particularly within the Italian diaspora, growing in popularity with tourism to Italy exposing others to espresso, as developed by Eiscafès established by Italians in Germany. Initially, expatriate Italian espresso bars were downmarket venues, serving the working class Italian diaspora and thus providing appeal to the alternative subculture; this can still be seen in the United States in Italian American neighborhoods, such as Boston's North End, New York's Little Italy, and San Francisco's North Beach. As specialty coffee developed in the 1980s (following earlier developments in the 1970s and even 1960s), an indigenous artisanal coffee culture developed, with espresso instead positioned as an upmarket drink. 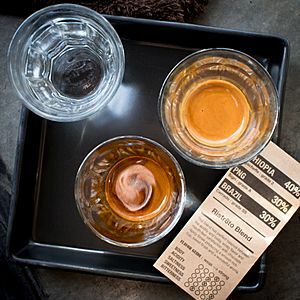 In the 2010s, coffee culture commentators distinguish large chain, mid-market coffee as "Second Wave Coffee", and upmarket, artisanal coffee as "Third Wave Coffee". In the Middle East, espresso is growing in popularity, with the opening of Western coffee shop chains. 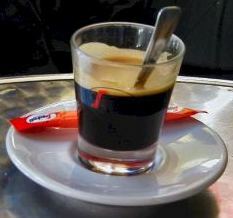 Cold espresso (espresso freddo) is an alternative form of espresso, mostly served in southern Europe. Conceived in Greece, along with cappuccino freddo in the early 1990s, freddo espresso is in higher demand in Greece and its neighbouring countries during summer. After preparing 2 shots of espresso (usually ristretto), the coffee is stirred in a big iron can along with sugar (if necessary) and 2-3 ice cubes until the can is cold. Then, the blend is put in a glass full of ice cubes. In addition to being served alone, espresso is frequently blended, notably with milk - either steamed (without significant foam), wet foamed ("microfoam"), or dry foamed, and with hot water. Notable milk-based espresso drinks, in order of size, include: macchiato, cappuccino, flat white, and latte; other milk and espresso combinations include latte macchiato, cortado and galão, which are made primarily with steamed milk with little or no foam. Espresso and water combinations include Americano and long black. Other combinations include coffee with espresso, sometimes called "red eye" or "shot in the dark". Espresso Facts for Kids. Kiddle Encyclopedia.